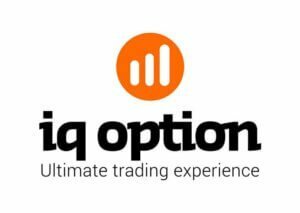 Talking about IQ Option, it is considered to be one of the most innovative trading platforms. Their binary options tournaments are one of the best instances. There are only a few binary options platforms that offer such options. And IQ Option’s tournaments with their unique feature, not only add a fun element, but also bring sophistication to the overall application. Aside, they create a sense of competition among the users, thereby allowing them to win quite a lot of money. How Do the IQ Option Tournaments Work? If you are willing to participate in the tournament, there is an entry fee that needs to be paid. However, the fee is affordable, varying from five to twenty dollars. Besides, each tournament has its own duration, which can be as long as a week or a month. But then there are also a few lasting for a day or less. In short, you don’t really need to spare much time on this. Your entry fee will provide you a virtual tournament balance that could be either of $100 or $10,000 – depending on the turnament rules. And once you have it, you are able to make the most of your IQ Option trading account. Individuals sustaining with the highest tournament balance at the end are rewarded with the top prize. While most prizes are set beforehand, there are also variable prizes and depend on the number of participants. This means the more is the participants, the higher the prize. Well, the rules of each tournament vary. For instance, some come with an option to buy back to get on track in case you lose all the virtual tournament money. Normally, this buy-in cost is as same as the initial entry fee, topping your tournament balance to $10,000, so that you can start trading all over again. But then there are a few that do not give this benefit. The above picture is from one of the tournaments, starting on 31. 12 and lasting for a month. Both initial and second fee for this tournament is $20. In this particular tournament you can expect to receive $10, 000 that is quite a good amount. Also, there are participants checking for your score. These tournaments are a new twist in the binary options trading and are appreciated by most. In case you haven’t tried yet, you should give a try. 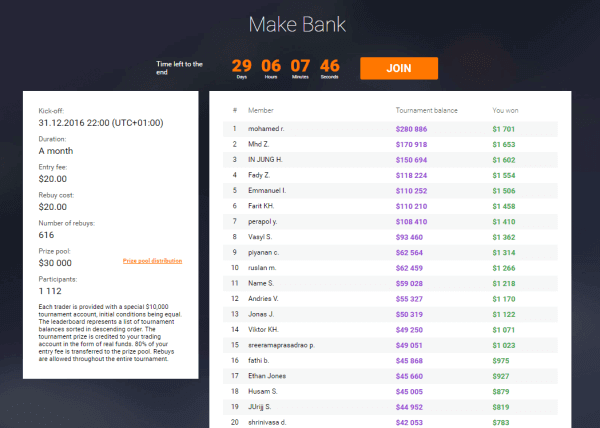 Significantly, you can earn a lot of money in thirty minutes without making much investment. The majority of the IQ Option tournaments come with multiple prizes even though the value of each depends on where you are on the leader board. It can be quite tempting to maintain your position when you are in a lower position, ensuring to receive the least of something. But then, such strategies can limit your potential, which means you may never receive the top prize. There are participants who jump into trading as soon as the tournament starts. This is a total No-No. Never do anything blindly. Take some time off to understand how the other participants are trading. Watch carefully if they are being aggressive or cautious. However, do not allow anybody to create too much of a head start before you even start. Being watchful initially will give you the competitive edge at the right time. Before, you implement your strategy; you should have a good idea of the approach of other participants. Similarly, you should be aware of your position on the leader board. And when you know about it that is the right time to begin adapting your strategy, so that you find yourself in a better position at the end. Say, if your main competitors are using a conservative strategy, then you can choose to be aggressive to overpass them. And if you are the leader already, then you should begin on maintaining your position without taking risks much. If this isn’t the case, then work more on your strategies and try to keep yourself close to the leaders to be able to make the final push closer. Don’t lose hope if the tournament was not successful. If you have some balance, you still stand a chance of winning. And know that this is the right time for you to get away with caution and take risks. If not, then you will lose in the long-run. So, keep trying! Whether you are successful or not, it is essential that you analyze your strategy when the tournament is over. This will help you in identifying the areas for improvements. Besides, the knowledge derived from the analysis can be used the next time. If you have any experience with binary option trading tournaments, then let us know. Please post your comments below!